I have full upper dental implants, the kind that are removable, the kind that snap in with four posts. I need the locator male retention caps, but my dentist charges me $25 for one! Not one set—one single little piece of silicone or nylon (I’m not actually sure what they are made of). I can’t afford to pay that much anymore. I have seen them online for $20 for a set of four, but I cannot order them because I’m not a dentist. Is there anywhere I can buy them without being a licensed professional? While I understand why your dentist may feel that he or she needs this markup because of high office overhead, this is such a small item in the dental office operation scheme of things, you would think they could make some allowances. Anyway, I have a couple of ideas for you. The first is to call around, explain your situation to various dental offices, and I’ll bet you could find someone who would order them for you at cost. Dental offices tend to be populated by friendly, kind people, and I would think you could find a sympathetic dental assistant who would order these for you. The dentist doesn’t actually have to be personally involved at all. The staff usually does all the ordering. But I actually believe you can order these without being a dentist. If you go to ebay rather than an established dental supply house, I am finding dental implant locator caps available there from overseas sellers and they are not requiring any documentation of your being a dentist or dental professional. The caveat here is that you need to know exactly what you want and how to pop them into your denture. There are various strengths of these caps—soft ones and firm ones that give different amounts of resistance. And they’re about $20 a set or more, depending on whether or not you get some other things with the caps. I have 3 titanium implants now and have heard that zirconia, brand name CeraRoot, might be a better option because the titanium might cause neurological ill effects. What are your thoughts about which might be better for the patient? I would recommend the titanium implants. I have one myself. I am not aware of any research that suggests any adverse neurological or other biological effects of titanium on the human body—it is one of the most biocompatible of all materials. I don’t have a problem with the zirconia implants, but there is much less experience with them, and I don’t know any reason to vary from the time-tested success of titanium implants. Titanium has been used for decades, not only in dental implants but in joint and bone replacements all over the body. There is a certain appeal to metal-free dental implants because there are some metal sensitivities that cause problems that some people have with certain dental work. But a blanket condemnation of metal in the human body isn’t justified, in my opinion. Remember that there are certain metals, such as iron and zinc, that perform essential functions in our biology and are essential ingredients of our diet. I completely love your web site and enjoy reading so much of the wisdom you pass on to worried people. I am in the UK and want to ask your opinion. I am 61 so an old bird now however, I have always tried to look after my teeth. Over the past few years I have lost the teeth at the farthest back on both sides. I would love to think that if I managed to get a nest egg, I could have implants to make my teeth whole again. However, I have the severest metal allergy I think possibly doctors have ever encountered. I am proven allergic to nickel, cobalt, and a flutter to mercury. I cannot wear jeans, sandals with buckles and have to avoid all clothing with any form of metalised thread or adornments. Therefore, I know that implants may be a problem. Can you please advise me is there anything on the market whereby posts are made of some material which is not metal based. If there was I could perhaps start saving for my two implants and when I am really old, not fly into a panic when I lose a front tooth. I would be so grateful for your advice. Sorry to have gone on. Yes, there is a good solution for you. You actually have a couple of choices. First, nickel allergies are not all that uncommon, and many people have problems with cobalt. That shouldn’t scare you away from a titanium dental implant. I advise avoiding nickel in particular in any dental restorations or appliances because there are so many people with sensitivities to it. When you say you have a “flutter to mercury,” I’m not sure what that means, but it shouldn’t be an issue with dental implants because practically all of them are pure titanium and titanium is an extremely biocompatible material. If you’re uneasy about it, it shouldn’t be difficult to get an allergist to test you for titanium allergy. I wouldn’t assume that because you are allergic to some metals, even if those allergies are severe, that you can’t have any contact with metals. After all, there are metals known as minerals that are essential to our diet–iron, zinc, and calcium are all metals. But if you’re even uneasy about titanium, there are dental implants that are made out of zirconia, a super-strong ceramic. This is the only metal-free dental implant I’m aware of. It might take some work to find a dentist who will place zirconia implants, but there are some. I chose to use my regular dentist to do a dental implant as he has done hundreds of them over the years. When first attempting to place the implant, he informed me that I would need to have a bone graft first. He did the bone graft, then, after healing, I went back for the implant. He again attempted to place the implant but had to remove it as he said the bone was still too thin and he couldn’t do an implant after all. So now after three surgeries, I am left with no implant and the suggestion to get a bridge instead. Is it possible this could have also happened with a specialist? The short answer to your question is that no, I doubt this mishap would have happened with a dental implant specialist. Although dental implantology is not a recognized specialty in dentistry—there are just some dentists with more advanced training and oral surgeons and periodontists who specialize in surgery. However, I don’t want to be too hard on your dentist. It sounds like he is really trying to do the right thing and may have a lot of experience with implants, but bone grafting is a tricky procedure, and I think he may be a little short on experience with that aspect of implant dentistry. He may be just starting to get into the grafting. Any dentist who tries to explore new skills is going to have things like that happen. A dentist of lesser integrity would have just plowed ahead and placed the implant. It would probably have done just fine for a while and then failed at some point down the road. So I think he has done the right thing. Let me share a story of the first set of porcelain veneers that I placed. As time went on, I became accredited in cosmetic dentistry and felt that I produced truly beautiful work. But, as with any dentist expanding their knowledge, I had a first case. The patient would come back for regular checkups, and as my skills improved, I became more and more dissatisfied with how her smile looked, since it was very mediocre. Finally, I think it was after three or four years, I shared my feelings with her and offered to re-do her case for free, and she accepted. It sounds to me like your dentist is leveling with you, and feels like you will end up with a fine result. For a single tooth, a dental bridge or a dental implant are two acceptable ways to treat the case, each with their pros and cons. If you really want to go with the dental implant, you could ask your dentist to refer you to a periodontist or oral surgeon with extensive experience in dental implant surgery. Can I trust Comfort Dental? I’ve had a bridge across my upper front, replacing all my front incisor teeth and anchored by the two canine teeth. About a year ago, the anchor teeth were so loose that they were extracted. I was going to Comfort Dental and after they did the extractions they suggested that I get a partial to replace those teeth plus one upper molar that is also missing. So I did that last year, but I’m finding the partial to be extremely uncomfortable and I need something different. I asked Comfort Dental what I should do. They said they could replace my upper teeth using implants. They would use mini implants to keep the expense down for me, and they have told me it would last for ten years. I’m also missing three teeth on the lower left, and they would replace those with a flexible partial. I don’t have a lot of money, so I’m tempted to do with the cheaper option that Comfort Dental gave me. But after the experience with the partial, I’m not sure I can trust them. Yes, I can help you out with this. First, a comment about Comfort Dental. Comfort Dental is a corporate dental clinic with about 150 locations throughout the Midwest, Southwest, and Northwest. It isn’t the type of place I would go for quality care. The corporate model of dental practice is designed to maximize profit. While many patients find them convenient and inexpensive, they tend to be attractive to dentists just out of school who are trying to get some experience before launching out on their own, so they have a lot of turnover. You are more likely to get quality care from a dentist/owner practice where the dentist is trying to establish long-term relationships with patients. Now about the treatment plan. Mini implants are not designed to support individual teeth–they are too weak. They are cheap to place, but they are indicated primarily to help stabilize a complete denture. Giving your implants a lifespan of ten years may be generous, but even if they last the full ten years before failing, the failure of a dental implant is a serious event. What do you do after it fails? You can’t just place another mini implant because the reason the implant becomes loose is that it looses its bone support. So you have to have new bone grafted in before replacing the implant. No, you need something more solid. The other dentist is suggesting a bridge for your missing molar. This makes sense because it sounds like you need crowns on the teeth adjacent to the missing tooth anyway. 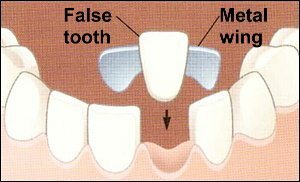 Adding a false tooth suspended between those crowns would add only about $1000 to the cost, much more practical than placing an implant with a crown on it, which could easily cost three times that. Then about your front teeth. Replacing four missing front teeth is a tricky proposition. You said you had a bridge replacing these teeth, but didn’t say how long that bridge had been present. I would be surprised to learn that it had lasted very many years, because of the high stress that would be on the anchor teeth (dentists would call these the abutment teeth). Let me share with you some dental bridge engineering principles. 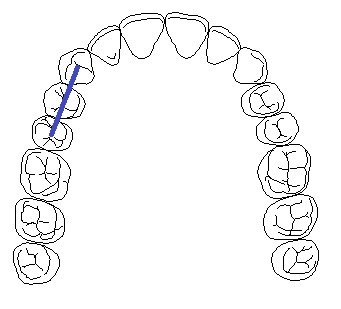 Here is a diagram of a dental arch. Let’s imagine that the first premolar on the left side of the diagram is missing and we’re going to replace it with a dental bridge. I’ve drawn a line between the proposed abutment teeth. You’ll notice that the replacement tooth is going to be suspended directly between the abutment teeth. This is a favorable stress situation. There aren’t going to be serious twisting forces on these abutment teeth. 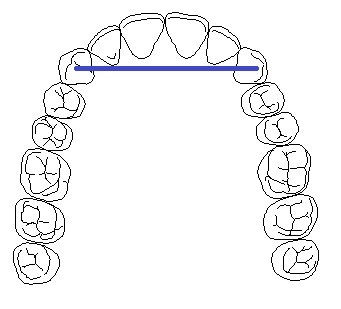 Here is another diagram of the same dental arch, but we’re going to imagine that we need to replace all four incisors. Imagine now when we put stress on the incisal edges of the very front teeth. That will produce a twisting force on the abutment teeth. This is what you had with the bridge that you lost. It’s not surprising that you ended up losing both abutment teeth–fairly predictable, in fact. Now implants placed in the positions of these canine teeth could be more sturdy than the original natural teeth, still, trying to support all those teeth with the two implants in the positions of the canines is risky, in my opinion. Placing a third implant somewhere close to the middle of the bridge would completely eliminate any twisting effect and would greatly increase the stability of the restoration. It could well last you for the rest of your life. My opinion. I hope this is helpful. After 30 years with dentures, can I get a pretty smile again? I have had an upper denture for close to 30 years. Can I have implants now? I have never had a pretty smile, and I would love to have a pretty smile. Yes, you absolutely can have a pretty smile now, with dental implants instead of the old upper denture you have, even if you have been without upper teeth for thirty years. Let me explain your solution in two parts, because it sounds like there are two parts to your problem. First, you say that you have had an upper denture for 30 years. Over that amount of time you are going to have a serious loss of bone in your upper jaw, and it is probably difficult to hold any kind of a denture in without denture adhesive, and even that may not work too well any more. That part of your problem requires dental implants to solve. I’ll explain what’s involved in that in a moment. Second, you say that you don’t have a pretty smile. That part of your problem doesn’t really require dental implants–it just requires having an attractive denture made out of quality materials that won’t discolor or wear down easily. When you have dental implants placed, they will likely be placed to retain a denture–you’ll be getting an implant-retained denture. It will be different from a removable denture in that it won’t cover your palate at all, but it will still be a denture. To illustrate, I am posting two photographs of patients with implant-supported dentures from one of our mynewsmile dentists. 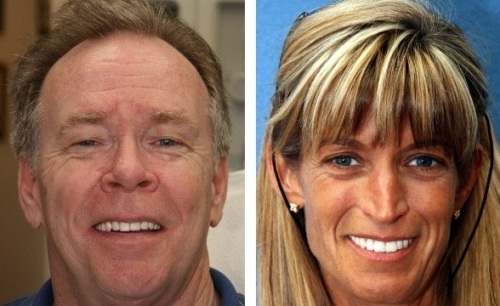 You can see that while Tom, on the left, decided he wanted a more subdued color to his teeth, and Brenda, on the right, wanted bright white teeth, that both have attractive, natural-looking smiles. Their smiles will continue to look attractive for many years because they are made of quality, durable materials. About getting dental implants, after wearing removable dentures for 30 years, you are going to have a significant degree of facial collapse. With facial collapse, you probably don’t have enough bone remaining in your upper jaw to be able to place stable dental implants. This can be solved with bone grafting. That’s a separate procedure that will require time to heal before the implants can be placed, and you will need an oral surgeon or an experienced implant dentist to do that for you. How should you proceed? With any dental implants case, you want to start by visiting the general dentist. Never start by seeing the oral surgeon, as we have seen some sad cases where, in their eagerness to make sure they are the ones to place the implants, they go ahead and place them before you see the general dentist and they place them in the wrong spots. In your case, since a beautiful smile is important to you, you want to see an expert cosmetic dentist. There are several excellent cosmetic dentists in Alabama, so you should have no problem there. My 12-year-old daughter is genetically missing #10, the maxillary left permanent lateral incisor. We had orthodontic treatment done to move the teeth far enough apart to put in a replacement tooth with an implant. That was completed in December. She now has a permanent wire bonded to the backs of the top 3 center teeth. Since she is too young for a dental implant right now, we opted to go for a Maryland bridge at the recommendation of her Orthodonist because we did not want to have her deal with an upper Hawley through her teen years. Two weeks ago (after taking impressions and slightly preparing teeth #9 & #11 about a month ago), our family dentist put in her Maryland Bridge. There was no metal on it and she cemented the two non-metal wings to the adjacent teeth. The next day we got new impressions for a new retainer and then the next morning, the Maryland Bridge fell out. She ordered a different type of cement and yesterday evening the same bridge was replaced; this morning while eating a waffle the bridge fell out again. 1. Will the metal wings on the bridge allow it to affix better to her teeth, lasting at least 5-6 years until we can get the implant? 2. Will there be damage to her permanent teeth (#9 & #11) when the Maryland Bridge is put on AND later taken off? I would like to avoid her needing unnecessary dental work on #9 & #11. 3. Cosmetically, will the metal wings make more of a difference than when they were porcelain? Since this is in the very front of her smile, it is so important that the blend is as close to perfect as can be. I am concerned that irreparable damage could occur on #9 & #11 (not to mention the self esteem of a tween girl at risk here due to this cosmetic, yet genetic flub.) Any advice and opinions are appreciated. 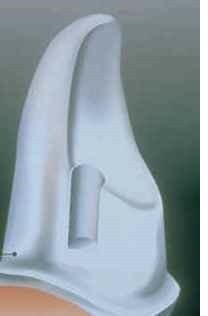 We are going back to the dentist next week for new impressions and for a new Maryland bridge with metal wings to be made (which I am not paying any additional money for.) Also, is there a price difference generally in the bridge that is all porcelain versus one with metal wings? Just curious. Thank you for taking the time to read this, it is TRULY appreciated. I just want to do what is best for now and especially for her future dental needs. I’m sure your dentist is well-intentioned, but she does not appear to be an expert in cosmetic dental bonding. And I would not let her do a metal-backed Maryland bridge, because I believe the same thing will happen, and I will explain why. There is a much easier, less invasive way to handle this. Maryland bridges can work well, but it’s not just a simple matter of making space for the wings and then bonding it on. There has to be some preparation done, and in that preparation there has to be what is called resistance form created in the teeth to which the bridge is bonded. There have to be some grooves or something placed to keep the bridge locked onto the teeth – you can’t rely on just the bonding to do it. So when you made reference to “slightly preparing” the adjacent teeth, that spelled trouble. The number one reason that Maryland bridges come off is inadequate preparation. Here’s a picture of a front tooth with a groove similar to the type of groove that would help this Maryland bridge stay in place. This is deeper than would probably be required here, but you get the idea. So your dentist did this “slight preparation,” and the bridge came off. She theorizes it must be the cement – let’s try a stronger cement. Nope, comes off again. Now she theorizes it must be the zirconia – if we switch to metal, it will stay on. No, it won’t work, because the problem isn’t in the materials, it’s in the design. Now she could go back and do the proper grooves or whatever is required to get the bridge to stay on, but then it makes no sense to do a dental implant later. The main reason for doing a dental implant is to avoid having to prepare the adjacent teeth. Once they’re prepared, you may as well stick with the bridge. The easy solution here is to do what we call a flipper partial. It’s just a false tooth affixed to a small plastic plate that fits behind her teeth and snaps on with metal clips in the back. In some cases the clips aren’t even necessary. But even when clips are used, people can’t see them. I’ve seen these hold up for many years and look extremely natural on very attractive women. A Maryland bridge isn’t an appropriate temporary restoration because the teeth have to be prepared. And if the preparation is adequate enough to hold the bridge in, it will later need to be filled in. It’s against my sensibilities to permanently prepare teeth for a temporary restoration. 1. Will the metal wings allow the bridge to affix better to her teeth? No – no way. In fact, I wouldn’t be surprised to hear that the dentist has more trouble bonding the metal on than the zirconia metal-free version. Metal is harder for most dentists to bond. 2. Will there be damage to the teeth? Yes. There already has been some damage by the “slight preparation” and there will be more damage if your dentist keeps at this, especially if she finally gets it right and prepares the teeth enough so that the bridge will stay on. 3. Is the metal in the bridge a cosmetic problem? Yes. The metal will darken the adjacent teeth. This is why dentists are moving toward metal-free Maryland bridges. I’m guessing that your current dentist should have no problem making a flipper partial that will work for your daughter. If you run into any trouble, get back with me and I’ll refer you to someone who can do this right. Can you bond a Maryland Bridge to porcelain crowns? Can you place a Maryland bridge between 2 teeth that are porcelain crowns on implants? On my upper right, I’ve been missing my first molar and my first premolar. There was another tooth between them, but that’s going to have to be extracted. Can my dentist just put a Maryland bridge in there and attach it to the teeth on implants on either side? The simple answer is that yes, you can attach a Maryland bridge to existing porcelain crowns, but it’s very tricky and questionable whether it would hold up over time. Many dentists have problems with Maryland bridges, resulting in a short lifespan for the bridge. They seem really simple to place—grind the adjacent teeth a little to make space for the metal framework, and then just bond it on. But it’s not quite that simple. There should be certain grooves placed in the preparation to resist the forces that will occur. Otherwise it is very easy to dislodge a Maryland bridge. And you have the added complication of having porcelain crowns on the adjacent teeth. The ideal is to bond the metal wings of the Maryland bridge to enamel. That gives the strongest bond. Bonding the bridge to porcelain is inherently weaker, even if it’s done right. And very few dentists know how to bond to porcelain. Then there is the additional complication of having to prepare the teeth with the porcelain crowns so that they have the proper grooves, with retention and resistance form that will help keep the bridge from coming loose. Placing proper grooves could cause the groove preparations to go through the porcelain entirely and reach the underlying metal. Now, instead of bonding to porcelain, the dentist needs to bond to metal, which is more difficult still. So yes, it can be done. But it’s a high-risk, difficult procedure. The ideal would be if the dentist would anticipate this possibility back when the original implants were placed. Knowing there is one natural tooth left between the implants, the dentist should be anticipating that at some point in the future the patient could lose that tooth. Then the implants for the missing teeth should be placed so that the abutments end up parallel and then use a screw-retained crown. When the tooth in between is lost, the dentist would simply unscrew the adjacent crowns and replace them with a bridge. Another solution would be to place a third implant in the missing space, assuming there is enough space in the bone to accommodate a third implant.